I totally didn't post on Day 8! I think i was pretty fried last friday. Today I was finishing up customizing the whole path. Customizing means, taking individually placed block in the MUE, and make them look like a pile of rubble or whatever, and have them in the correct world space to take lighting / shadow from their neighbors. Thank you to whoever drew me that Maya crash cat! It's so great! Sorry I didn't catch your name! Now that I'm happy with the lighting, and all the asset files are set up with the light rig, it'll be pretty trivial to rebake the lighting after some minor geo changes (Texture polish won't even require a relight). Looking at these images suddenly makes me nostalgic for Super Mario 64. Sorta reminds me of the Tick Tock Clock level, which was a platforming level where you climbed various platforms to reach the top of the inside of the clock. Some similarities in the platforming! At this point saying the environment looks great seems redundant. I think you can rest Jane. It looks like all that needs to be worked on is the girl's face a little bit more and then getting the bugs and gameplay just right. The actual environment, game design is just beautiful.... I don't know what could be added at this point in the stage till the game was given a greenlight for further development. haha, well, i'll have to say, a lot of these screenshots are taken by debug camera, so i'm cheating a bit. Tho it'll be nice if we can put some of these shots in, like, if the girl is just standing at a certain vista point for a while, idling, then maybe we can swing the camera to the "pretty" angle. Thanks everybody! There is still polish to do today but yeah, hopefully all the other pieces that are still in flux will come together at the end of today. omg that image suddenly makes me SUPER nostalgic for Mario 64! In the company employee directory, both Tim and I put Mario 64 as our favorite games.. I must say, MGS1 is SOOO GOOD! although, once I beat that game, I went back and played the origional NES metal gear (wich as a kid I could not figure out wtf was going on) and realised, holy crap, everything I loved about Metal Gear Solid, was in the ORIGIONAL!? how insane is that! I cant believe Kojima was able to think of all that amazing gameplay way back in like what, 1984? and make it work on a NES!? That is just nuts! You are right, it has got to be in the top 5 games ever made. It is a super amazing game. 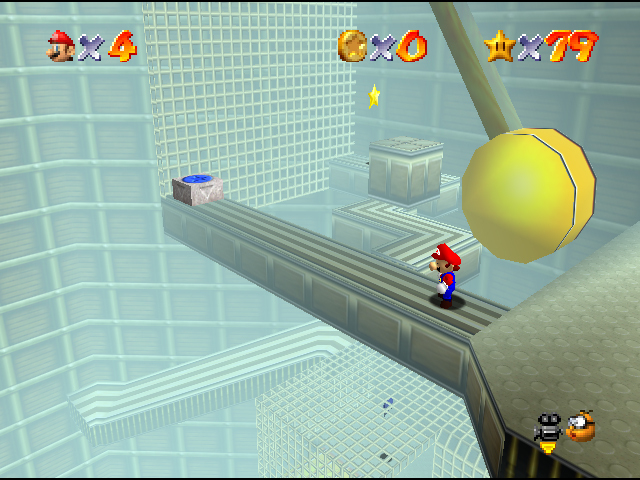 I especially love a game that is full of "secrets", and Mario 64 was bursting at the seams with 'em. So many happy surprises and discoveries. I think it must be the hardest thing to make a "secret" in a game that actually feels like a secret and makes the player feel super clever for getting it, rather than making something that was obviously meant to be found. And Mario 64 has so many! And they're all so good! Plus the way the game had a habit of not explicitly telling you the objective, and instead gave you a sort of riddle in the title of the star you were going for, and part of the fun was figuring out how the riddle applied in the level. BRILLIANCE. but the question, did you find all the secrets in Costume Quest? There was one in the Mall, that friends of mine actually called me on the phone to find! Oh no! I actually don't remember! It's been so long since I finished Costume Quest! But if it makes you feel any better, I played it non-stop start to finish! I recently just 100%d "Costume Quest". Are you referring to the Mall Quest with all the contestants and the judges? Or the Unicorn Costume Quest? I remember this one Chest all the way to the Left of the Mall that was guarded by tracks. There was some sort of trick where you had to follow the tracks to actually get to it. Yea! it was the unicorn one, follow the tracks allll the way to nowhere and you find the chest! To me its a no brainer, if there is path that doesn't stop you, go down it = find treasure! but a lot of people I knew were like ARG I CANT FIND IT! I loved the judge contest! That was my favorite addition to exploration mode, it was funny to put that one together! I hope you liked it.